A Cornwall-based practice has recruited two primary care pharmacists, freeing up doctors' time, delivering cost-savings and enhancing patient care. 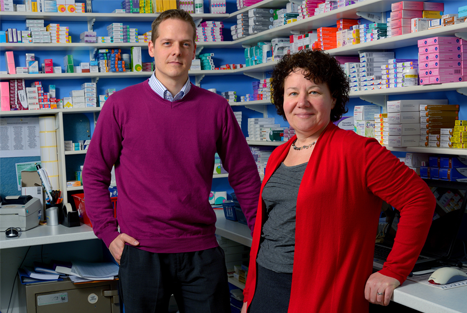 Dr Helen Williams and pharmacist Mark Stone describe how it works. It has long been my aim to blur the boundaries between pharmacy and general practice. When I qualified as a pharmacist in 1988, I wanted to be able to do more than respond to symptoms. At that time there were no supplementary or independent prescribing courses, so I retrained in medicine. After I became a GP principal, I suggested our 12-partner practice, Tamar Valley Health (Callington and Gunnislake Health Centre) would benefit from a primary care pharmacist. We appointed our first full-time practice pharmacist in 2008, and a second, working part-time, in 2010. Though this is still a fairly new approach it is becoming a more common arrangement. Some practices are recruiting roles to replace associate GPs or reduce their locum costs, for example. The pharmacists’ job description evolved over time: initially all the prescription queries were handled by them which freed up a good deal of GP’s time. Both pharmacists have completed the Independent Prescribing course (supported by the practice), so are able to prescribe in areas in which they are competent. I feel this qualification enhances the scope of a practice pharmacist and increases their job satisfaction. Patient medication queries generated by patient requests for prescriptions, or prescribing recommendations from other health professionals, are dealt with by the pharmacist. Again, this saves our GPs valuable time each day – around half an hour a day per GP. Medication recalls and safety alerts are dealt with promptly, since the pharmacist has immediate access to patients’ records, and can quickly carry out searches. For example, a recent NovoMix 30 patient-level recall was dealt with, and letters sent to patients within hours of receiving the alert. Being a part of the primary care team means that professional relationships can also be formed with the auxiliary team, such as community nurses, community matron, diabetic specialist nurses. Pharmacists attend the practice monthly clinical cases meetings, where their input is valued, and participate in the regular clinical governance meetings. There has been a further change in our practice pharmacist’s role with the introduction of a new telephone triage appointment system. Patients are now directed to an appropriate professional to deal with their need, such as a practice nurse or a GP. This now includes the pharmacist since they are well able to deal with minor ailments, again freeing up GPs’ time and appointments. Our pharmacists are an integrated part of the practice team. The patients’ value having a ‘medicine expert’ to be able to consult with and in whom they can trust. One of my patients even wanted to have a chat to the pharmacist before starting a new medicine I had prescribed. The cost of employing a primary care pharmacist is between 35k and 45k per annum. However, the savings delivered as a result of their expertise have been beyond that. For example, part of the pharmacists’ role is to run the dispensary more efficiently. Changes that have been implemented have enhanced income and produced savings for the business totalling tens of thousands of pounds per annum. In addition, though the practice doesn’t directly benefit from the savings, our prescribing budget in 2012/13 was £60,000 less than previously by targeting a number of prescribing switches. This is a significant saving for the NHS. In this practice, primary care pharmacists have been accepted by the patients and welcomed by the doctors and staff. They are an important part of the team. Is this the composition of future general practice? Medicines are the single biggest intervention for the prevention and treatment of ill health, with around 1,900 medicines dispensed every minute (growing at a rate of 4-6% since 2002). This costs the NHS an estimated £13.3 billion in 2012 and is the second biggest expense for the NHS behind staff salaries. Considering this, along with the training which pharmacists undertake to become ‘medicines experts’, it is almost an anomaly that pharmacists are not commonly found play a part in primary care general practice. The role developed for the primary care pharmacist in this practice focused on our area of expertise: medicines. This means I conduct clinical medicine review clinics, I take all medicine/prescribing queries that come in to the practice from patients and others such as hospital doctors or district nurses, and handle the numerous prescription requests that would have been sent to GPs. In addition, I work to help increase clinician capacity for same-day appointments to ensure every patient who needs to be, can be seen. Medicines management is another important area of my work, where I augment the quality, safety and efficiency of the practice’s prescribing. The clinical nature of the work was initially hard for me to master coming from a community pharmacy. However, I now make more clinical decisions in a morning than I previously did in a month. The volume of work that arrives in general practice was another revelation: in the Monday morning surge of calls from patients, I can typically complete up to 30 same-day telephone consultations. The pharmacist-led clinical medication review clinic is where I believe pharmacists can offer real benefit in improving long-term patient outcomes. The WHO has stated adherence among patients suffering chronic diseases averages only 50 per cent. Poor adherence by patients has been liked to significant deterioration of achievable outcomes. For example, a study in the European Heart Journal showed a 3.8 increase in the odds of stroke death with poor adherers to antihypertensives. The cost to the health system of non-adherence has been reported to be around £500million in the UK (for 6 disease areas). Evidence of the positive difference a pharmacist can make on adherence is emerging: an example is a recent study published in JAMA showing a significant improvement in adherence post-hospitalisation for acute coronary syndrome. There is also evidence of improvements in adherence in both diabetes and COPD. In practice, a clinical review consultation focuses on increasing adherence to medicine regimes through removing any barriers that reduce the patient’s ability to comply to treatments, and providing the patient with educational and behavioural support. Although we are unable to quantify savings made in improved patient therapeutic outcomes, evidence states that even small improvements in adherence can achieve huge reductions secondary care spend, for example in unscheduled admissions. I work to ensure that key QOF and disease indicators (for example, BP, HBa1c, CVD risk) are met to improve patient outcomes, that the patient’s therapies are evidenced based, and that there is a disease management plan in place which includes lifestyle recommendations. I believe this is a great example of the much talked about ‘medicines optimisation’, by influencing improvement in patient outcomes from effective medicines use. During these pharmacist consultations I have diagnosed a type II diabetic, intervened in a patient with NSAID induced malaena, addressed many side effects by adjusting therapies, and helped patients manage their conditions effectively. Patients have accepted me and have given feedback that they are satisfied with consultations. A few patients have specifically booked to see me to deal with medication issues. Leading on quality and safety for the practice’s prescribing practice also fits well with the pharmacist role. The need for good practice is well documented by the GMC’s 2012 PRACtICe study which indicated the overall prevalence of prescribing and monitoring error in general practice to be at 5 per cent. Pharmacists are proven to support good prescribing practice, as the PINCER study published in The Lancet in 2012 evidenced. To enhance prescribing quality and safety as part of the practice pharmacist role I have implemented drug safety guidance from the Medicines and Healthcare products Regulatory Agency on statins and calcium channel blockers, PPIs and clopidogrel and dosing of citalopram. I have completed audits on the new oral anticoagulants, antibiotics, hypnotics, and insulin passports. Another area which is well documented to increase the risks for patients, is the transition of care setting. Hence I help the GPs process hospital discharge summaries and clinic letters, adjusting therapies if needed, and more importantly scheduling necessary follow ups for bloods or dose titrations. General practice, like all other areas in the health system, is suffering from incessant demand caused in part by an ageing population. The practice has instigated the ‘doctor first’ triage system for patients requesting same day appointments. This system aims to manage patient demand by prioritising higher risk patients and conditions to the available clinician consultation capacity. The pharmacist has a number of appointments allocated to patients suffering from specific conditions and who need a face-to-face consultation. This is a new role we have recently undertaken. It can be challenging but is also very satisfying. I have been involved in some interesting clinical situations: a patient who had double dosed her insulin, a patient who consulted on a ‘painful heel’ while taking levofloxacin (rare side effect) and a patient which I suspected had pneumonia. The key to being able to develop this acute care role is having immediate access to patient’s records and easy contact with our supportive GPs and nurses. Last but not least, part of my role has involved looking after the business side of the dispensary. I made a number of changes soon after starting, including a total review and rationalisation of all our suppliers bringing considerable cost savings. To meet the demand of an ageing population with more chronic conditions there will need to be an increase in the number of clinicians. This will be essential in primary care as more complex care is being delivered in the community. However, predicted shortfalls in the numbers of both GPs and practice nurses over the next decade could exacerbate the current recruitment crisis. This contrasts with the number of pharmacists, where it is expected there will be an oversupply. The pharmacist bodies, the Royal Pharmaceutical Society and Pharmacist Defence Union, has stated that new roles similar to my practice pharmacist position should be developed for pharmacists. The looming workforce issues for general practice could be an opportunity for the primary care pharmacist role, as described above, to be embedded as a core part of a GP practice.